As I’ve mentioned many (many) times before I am a huge fan of edible wedding favors. Everyone likes sweet treats and if you send your guests home with individual packages of cookies you know they’ll be happy. These personalized text wedding cookies are super cute! 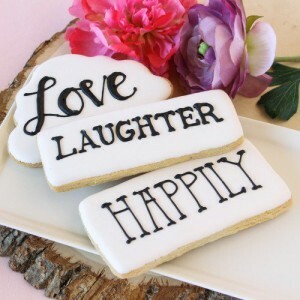 You can choose from clouds with the word “Love” or rectangle-shaped cookies with “Happily” or “Laughter.” The cookies are made from a butter cookie recipe with a touch of almond and are hand decorated with royal icing. Cookies are individually wrapped in cello and tied with a ribbon in the color of your choice, which makes them perfect for sending home with your guests! You can find these cookies – and other designs – here.